Coffee cart There are 3 products. Brand new, ready-made 'Coffee trolley'. 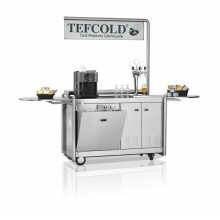 A fully mobile stainless steel kiosk perfect for catering, festivals, fairs, airports, etc. As standard, the unit includes a dual sink with hot and cold water, water tanks, refrigerator. No VAT included. Brand new, ready-made 'Coffee trolley'. 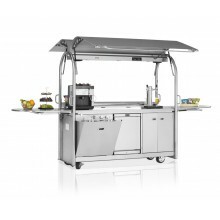 A fully mobile stainless steel kiosk perfect for catering, festivals, fairs, airports, etc. As standard, the unit includes a dual sink with hot and cold water, water tanks, refrigerator, cash drawer, LED light, illuminated display holder and radio-CD.